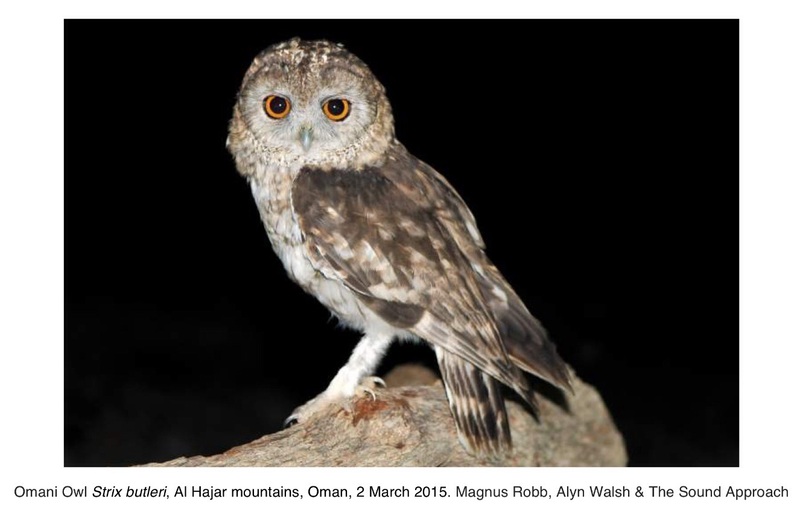 Discovered in 2013 by Magnus Robb and the Sound Approach and confirmed using sound analysis, Omani Owl has created a stir among both birders and biologists. That a bird around the size of a Barn Owl Tyto alba had evaded discovery was extraordinary. That it was described and named only using sound recordings and photographs was controversial. When a rival group of researchers re-examined museum specimens of the closely related Strix butleri, they suspected that its type specimen was in fact an Omani Owl. All the other specimens were different enough, especially when their genes were analysed, to be described as a new species, Strix hadorami. However, the study did not examine DNA of Omani Owl. In a new paper published online tomorrow, Magnus Robb and his colleagues returned to the mountains of Oman where they captured and released an Omani Owl. * Feathers and blood from the owl corroborated both teams’ findings that there are two different Strix species in the Middle East. DNA analysis shows that Omani Owl is the same as Strix butleri, and the other species is the recently named but much better known Desert Owl S hadorami (previously ‘Hume’s Owl’). So when Magnus heard unknown sounds of an owl in March 2013, he was in fact rediscovering a species previously known from just one tatty old specimen in The Natural History Museum (Tring, England) said to be from Pakistan, and collected 135 years earlier. The new paper also examines DNA from a mystery owl discovered in Mashhad, northeastern Iran in January 2015. Babak Musavi and Ali Khani took four feathers for DNA analysis, which the team showed was also of an Omani Owl, the first confirmation that it still exists outside the Arabian peninsula and 1300 km from the nearest record of this species. *with the permission of the Omani Ministry of Environment and Climate Affairs, as part of a joint conservation project with the Environment Society of Oman and BirdLife International.